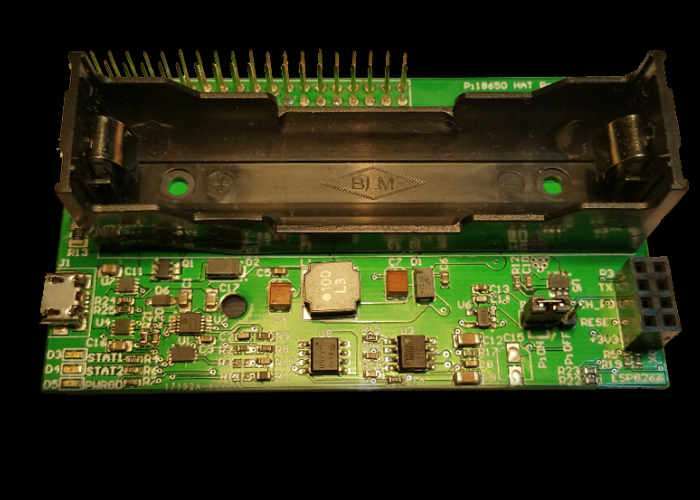 Raspberry Pi enthusiasts that are looking for a way to power their Raspberry Pi Zero mini PC using just a regular battery, may be interested in a new Raspberry Pi battery power HAT which has been created by Mark Chin, based in Waterloo Canada. The Raspberry Pi Zero uses approximately 87mA without and 103mA with a USB dongle plugged in, Mark explains when the Raspberry Pi battery power HAT is installed with a fully charged 3,000mAh battery, the Pi would run for 34.5 hours with nothing attached. The Raspberry Pi portable 18650 Li-Ion Battery HAT development board has this week been launched via Kickstarter and is available to back with shipping expected to take place during March 2017. Watch the promotional video below to learn more about the unique Raspberry Pi HAT and its features. The Pi18650 is an add on HAT which plugs into the 26/40 pin connector on the Raspberry Pi. This HAT allows you to operate your Raspberry Pi without a power cable and can use various capacity 18650 Lithium Ion batteries. On board is a 1A battery charging circuit for charging the battery. The Pi18650 development board also includes a 4×2 100mil header for use with a ESP8266 (ESP-01) wifi module for remote monitoring and CLOUD integration. Included is one additional stacking header for extra clearance when stacking other HAT’s on top of the Pi18650. As an example the Raspberry Pi Zero uses approximately 87mA without and 103mA with a USB dongle plugged in. With a fully charged 3000mAh battery, the Pi would last 34.5 Hrs with nothing attached. The Pi18650 holds a single cell lithium Ion 18650 form factor battery which should have an integrated battery protection circuit. The boost circuit maintains the voltage to the Pi at 5.1V for battery voltages of 3.7V to 4.2V. The jumper allows you to disable power to the Pi and Isolate the battery circuit or start the Pi. It also includes a charging IC which can charge up to 1A from the USB Micro connector and has a battery monitoring IC which communicates to the Pi via I2C. We have coded a Python script using I2C SMBUS for you to read the battery status. Charging LEDs show the status of the charging process. The Pi18650 can also be used with other development and SBC boards. Any DC power supply, adaptor or solar panel up to 18V max can be used with the charger. Use a good quality USB Micro cable as we found the flat style thinner cables did not work well with the charger and current was limited. The thicker round USB Micro cables work well. For more information on the new Raspberry Pi HAT jump over to the Kickstarter website for details by following the link below. If you enjoy building Pi projects you might be interested in our comprehensive list of Raspberry Pi displays, HATS and small screens.